We spent Christmas eve at the newly-opened Restaurant David Toutain, the inventive chef who had previously put l’Agapé Substance on the map. 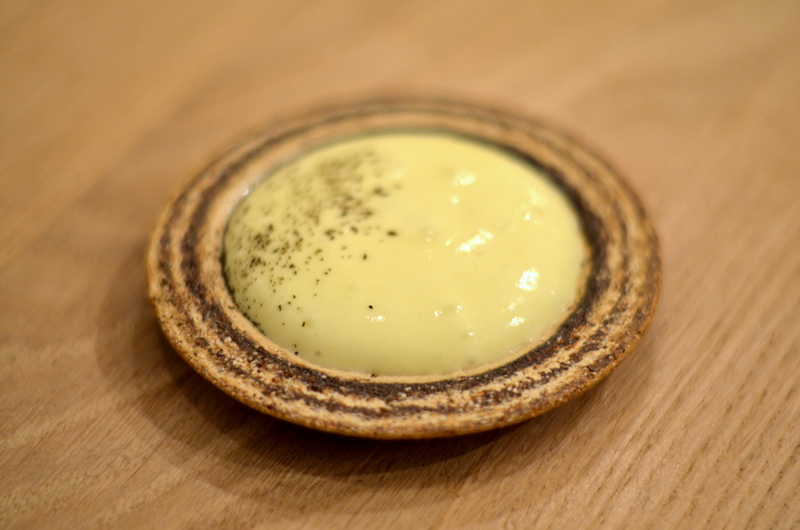 Prior to arriving in Paris, I’d originally made reservations for the latter, somewhere I’d been meaning to go since some of the chefs at Mugaritz recommended it ages ago (2011). But Chef Toutain had moved on, and Chef Christophe Hache, who I had met when he came to De Gustibus Cooking School, mentioned that Chef Toutain had just opened an eponymous restaurant in the vicinity of the Eiffel Tower. The culinary world is so small sometimes. 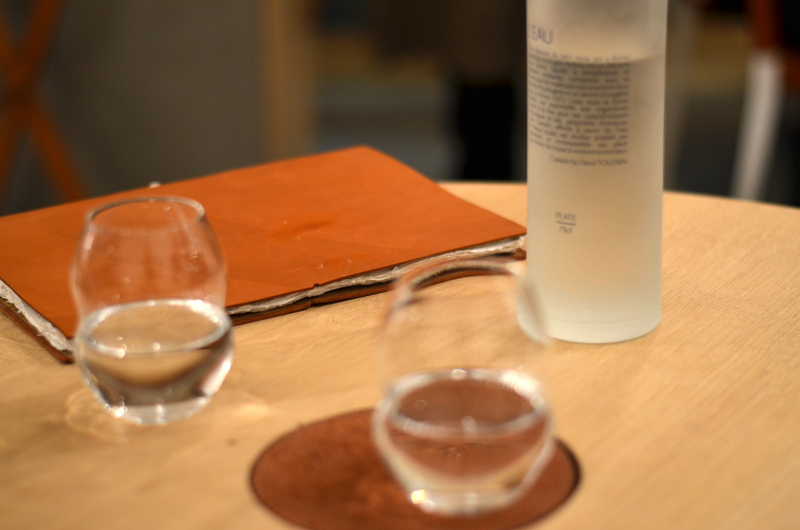 There was just one tasting menu, a combination of the several selections of tasting menus typically offered (including the truffle menu). 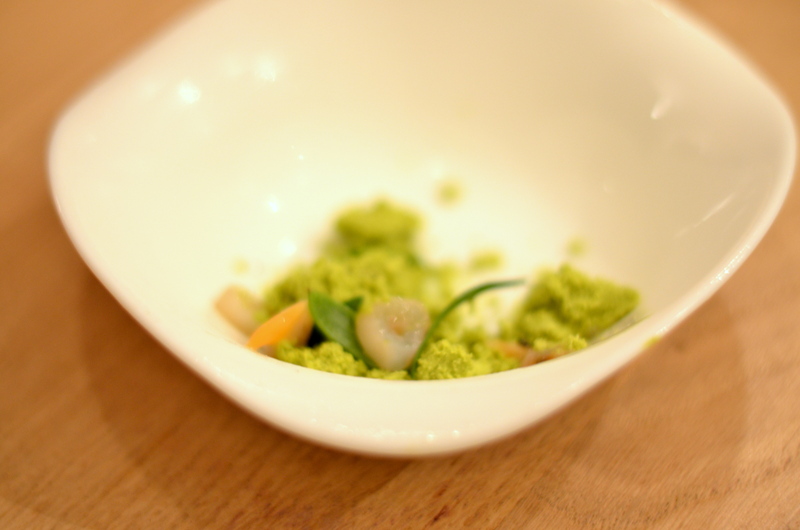 One of the things that the chef gained a reputation was an adroitness with and love of vegetables. 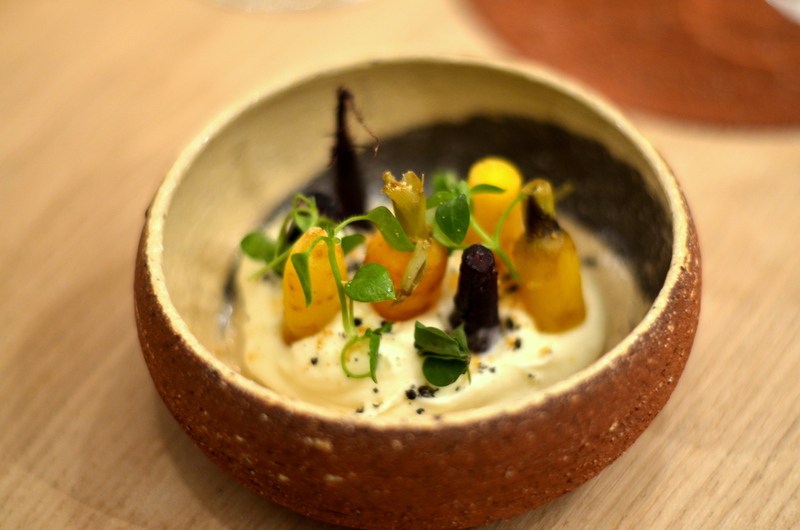 We started appropriately with a bowl of roasted carrots in a parsnip and white chocolate purée, with a sprinkling of crushed sesame powder. It was an opening note to an extended étude to the possibilities of vegetables. 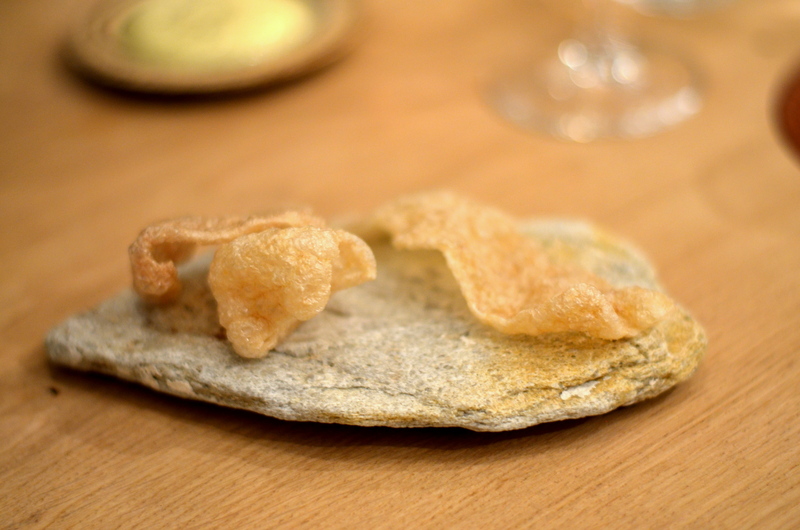 This worked as well, a purée of smoked potatoes, and instead of chips, we got upgraded to perfectly crisp chicharrones. 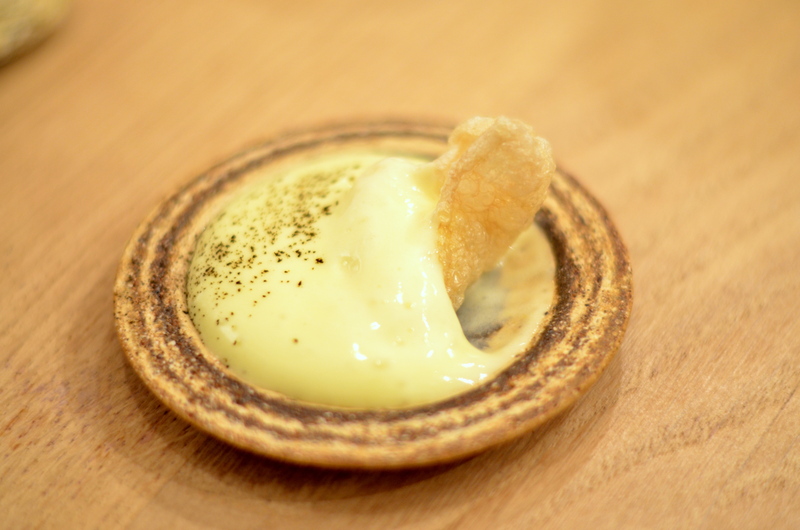 This adaptation of croque monsieur: a finger sandwich of onion compote, smoked eel, parmesan, and beurre noisette emulsion. 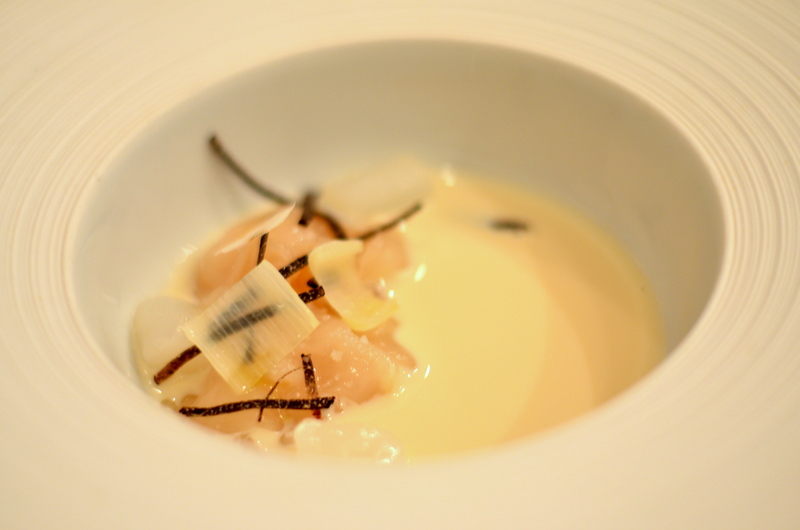 A two-part dish: iced fennel powder with raw cockles and razor clams, and a broth that is added after we took a few bites of the iced powder. Interesting presentation, but I couldn’t get past the flavor of cockles. 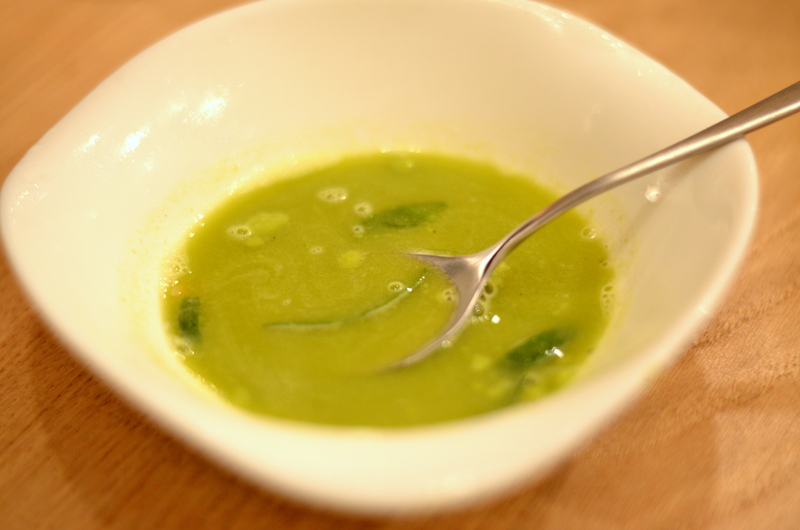 The soup would’ve been more palatable had it been hotter, but mixed with the ice it was lukewarm. 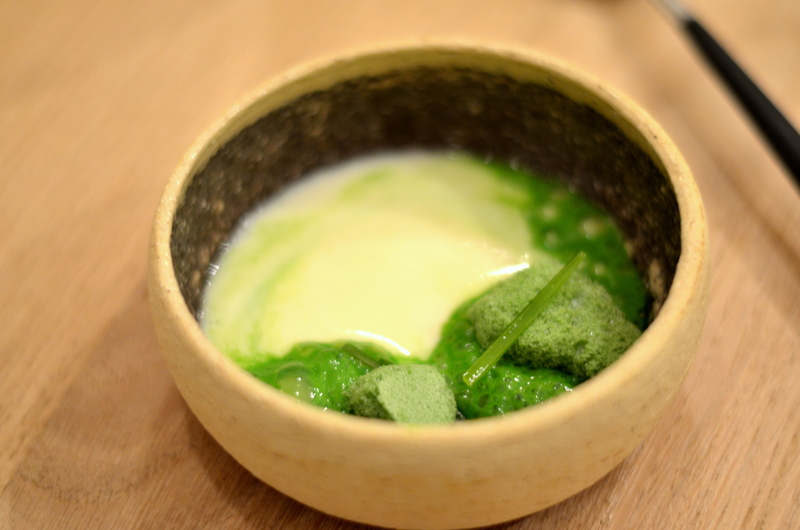 Next was a medley of parsley: meringue, oil, and mousse, with a length of parsley stalk, to which a velouté of parsley root was added. 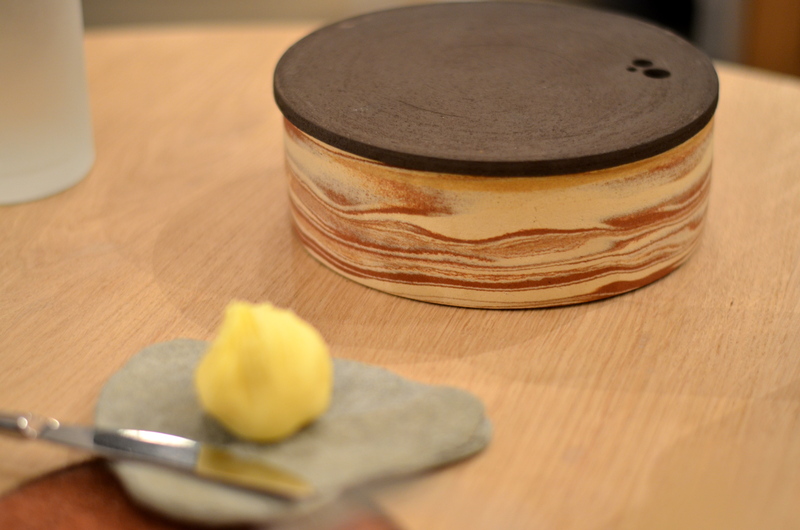 This exquisite cylinder held a delicious duo of bread, which came with a fantastic housemade butter. 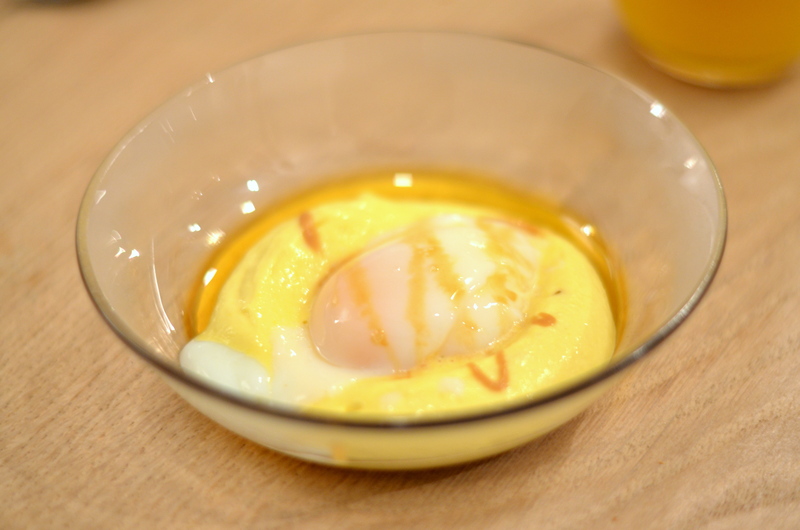 Slow-cooked egg on a bed of corn mousse and caramel of caraway. Amazingly creamy and delicious, with such unique versions of sweetness. 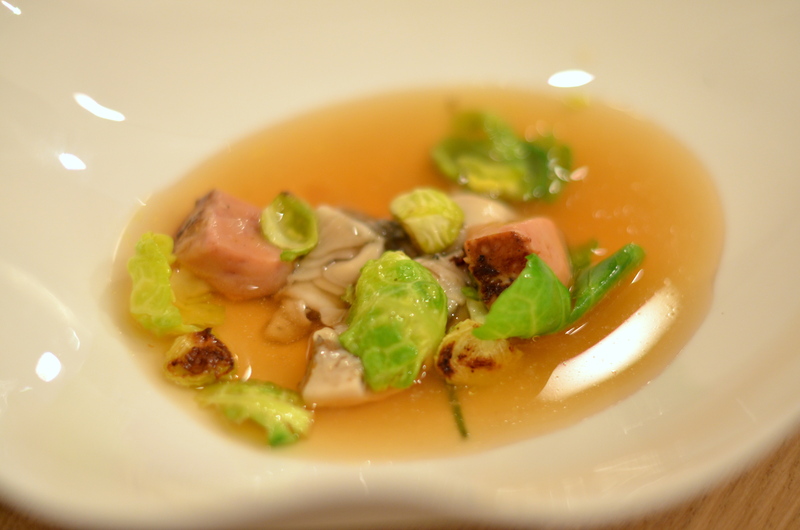 Another interesting combination: oyster, cubes of seared foie gras, roasted brussels sprout leaves in a potato consommé. 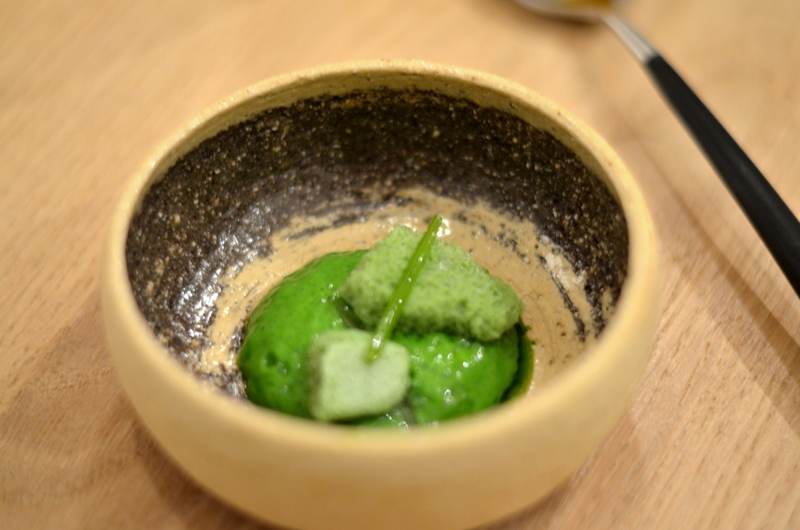 Everything about this dish was fantastic except for the oyster – no technical deficiencies, but I’m partial to oysters raw or deep-fried, with very little in between. The brussels sprouts and foie gras were a delightfully surprising combination. 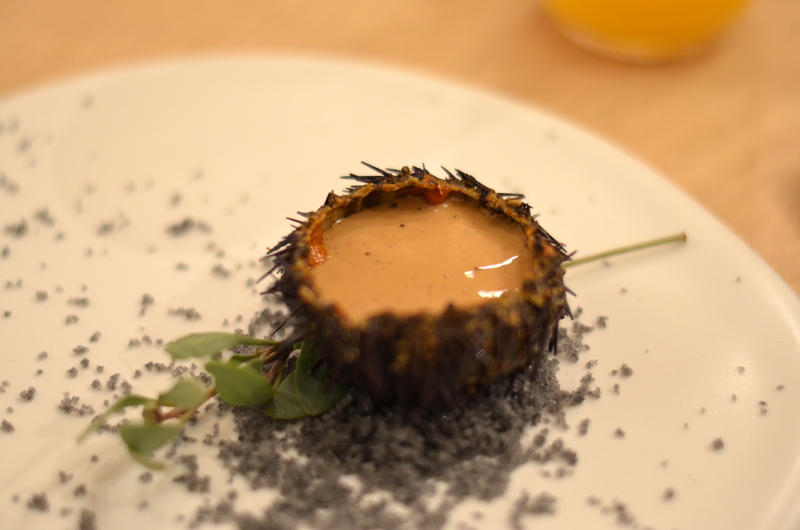 Uni in its shell, topped with a coffee mousse, which unfortunately masked some of the refreshing umami (or what one would presume to be there). That said, the intensity of the coffee was an interesting departure to the typically mellow, melting fattiness of umami. Scallops St Jacques with strips of black truffle in a velouté of some sort: One of my favorite dishes of the night: cod filet, lemon butter, sweet potato purée, vanilla, and saltbush leaf. 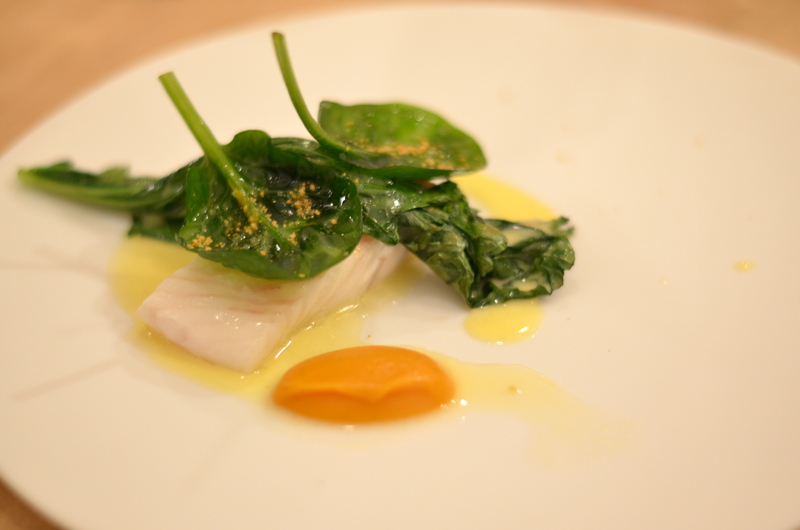 A luxuriously tender piece of fish accented by buttery acidity and a smooth sweetness, all in great balance. Salty smoked fish in a black sesame mousse. 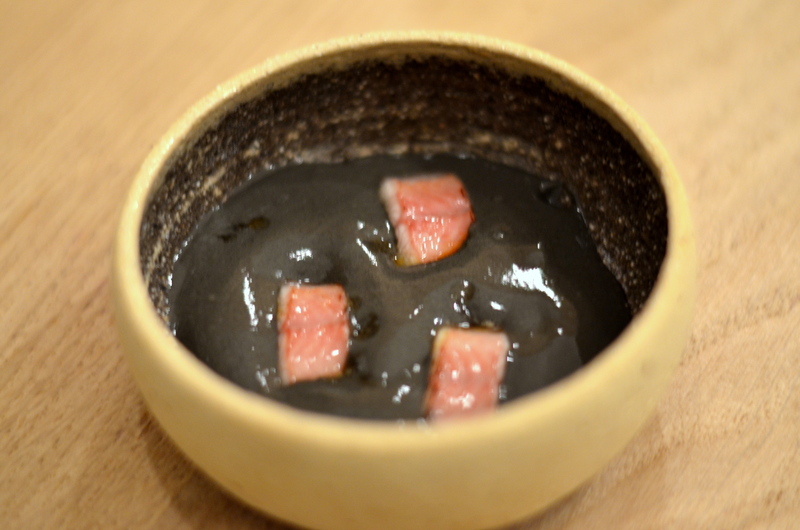 Black sesame is so ingrained as a dessert flavor for me, but it did a good job to mellowing out the salinity of the fish. Roasted poussin (I think it was poussin? 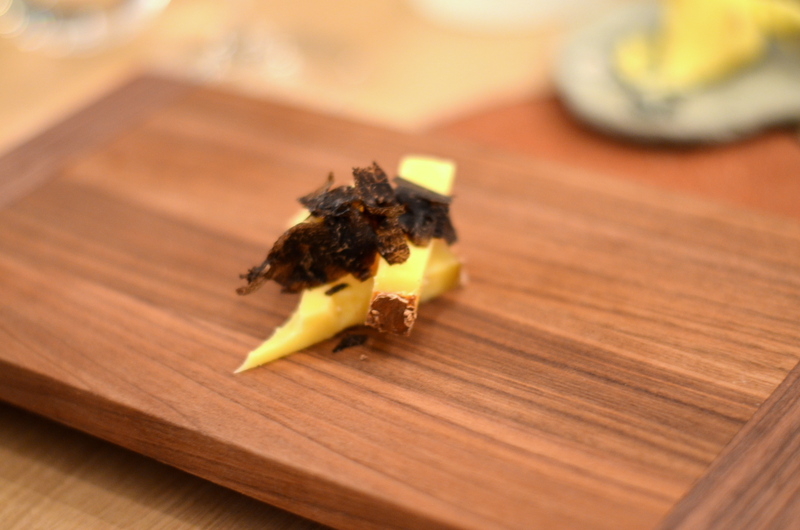 ), with green onions and black truffle. 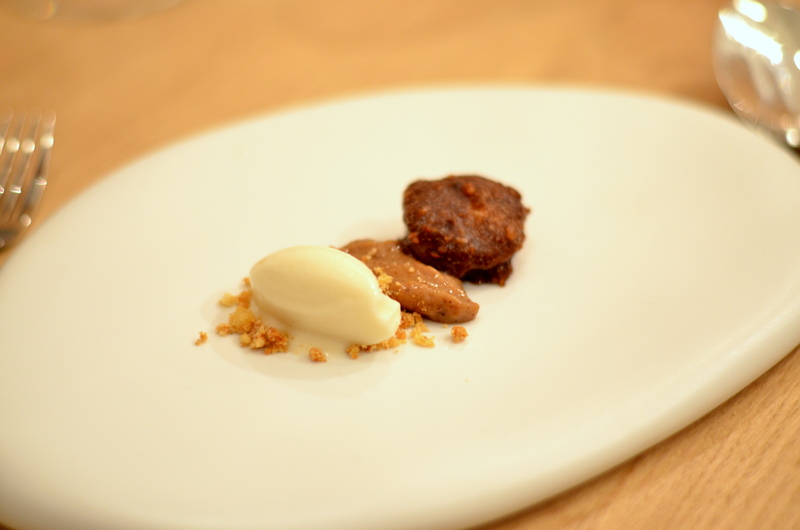 The first of a duo of desserts featuring sunchoke: this one with ice cream and pralines. This one with pineapple, chestnuts, celery root. I’m not entirely sold on the whole sunchoke (or Japanese artichoke) thing, but it’s not shabby as a dessert, with faint notes of maple, a meaty textural contrast to clean, acidic sorbets or simple gelato flavors. 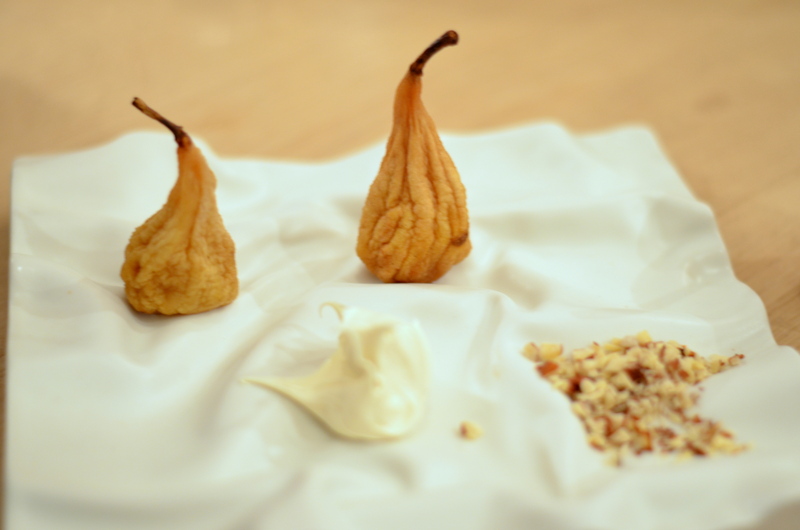 My favorite dessert of the night: dried pears with crème fraîche and crushed nuts. The pears were so sweet, that sugar intensely concentrated through the drying process, along with that grainy crunch of pears (which wasn’t entirely lost). Chef Toutain’s incredibly sweet and cheerful wife, Thai, told us that they treat their kids to these as an afternoon snack at times. 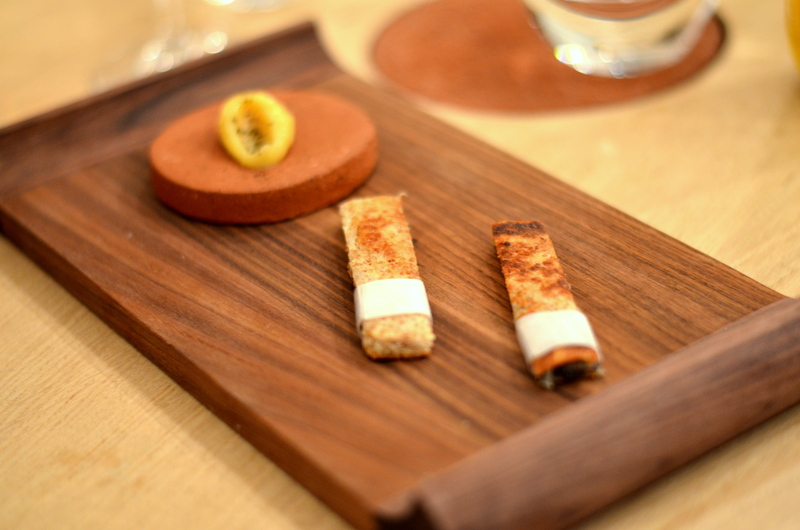 What a life it would be growing up as the children of a Michelin-starred family. 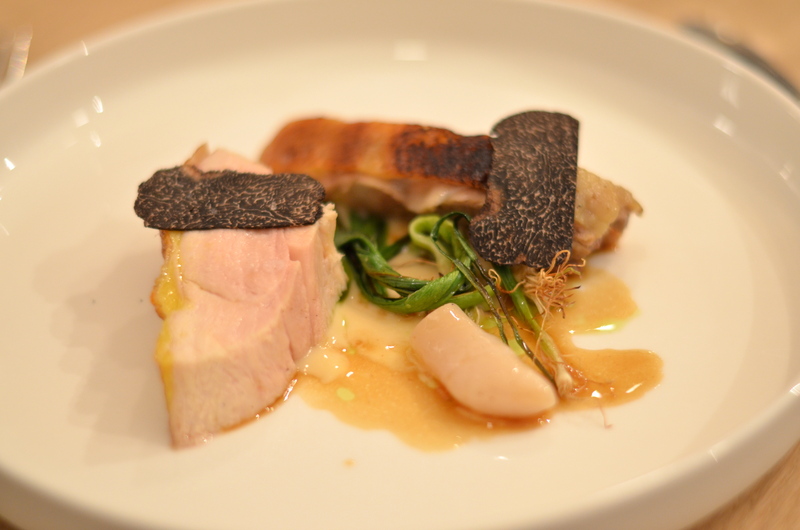 Both Thai and David spent time in Brooklyn, when David cooked with Paul Liebrandt at Corton, in California (The French Laundry), and St. Sebastian (Mugaritz). So even before Agapé, already an uber-impressive résumé. You can tell that from a technique perspective, Chef has his ducks in a row. 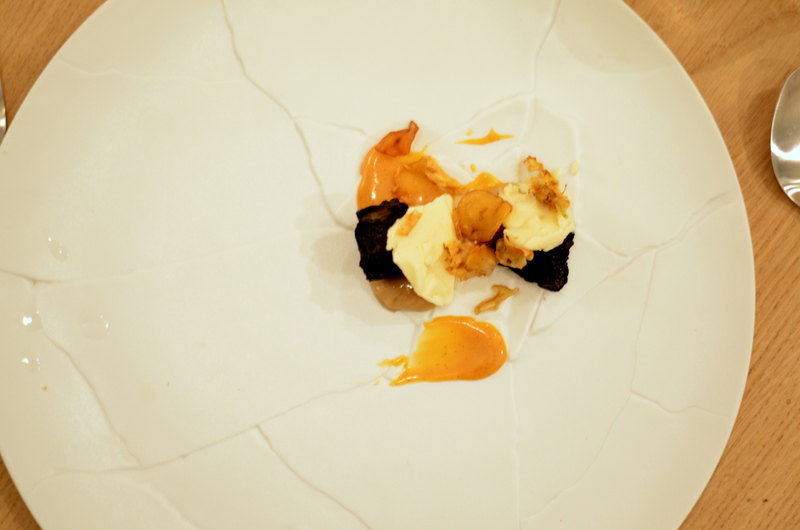 The dishes that wowed me – the smoked potato purée, the cod, the dried pears – were from a combination of intensely honed, often natural flavors and careful execution, and the ones that didn’t were not from a lack of technical prowess. Not all the combinations made sense to me (and the cockles in particular were a major turnoff), but I suppose that is the nature of the beast. As a sort of afterthought, the service was very inviting and warm – in large part because we shared a short conversation with Thai, whose overwhelmingly warm hospitality permeated the spartan space. She showed us the upstairs library overlooking the dining room, where during the day the kids do their homework and Chef Toutain sketches out his next ideas. The restaurant very much has a familial feel. A very special Christmas Eve indeed. Thai also has an incredible photography blog here.